Wanna see what I was yelling about....??!? Stampin' Up clear mount stamps!! Seriously, this is what I was yelling about a couple of weeks ago--and in 2 more weeks you can order them for yourself! I love love love the design!!! The clear blocks have a groove around the edge like our wood blocks do. See the DVD cases that hold the stamps sets? There are images of the stamps on the binding and the front--soooo easy to see what you're looking for now! AWESOME!! 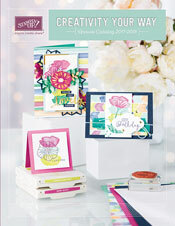 The new Occasions Mini Catalog is going out the mail today and you will LOVE what you see! (At least I LOVE IT). 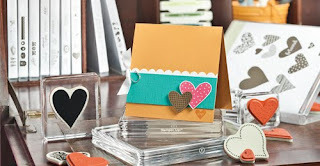 In addition to the Wood Block stamps, Stampin' Up is now going to offer CLEAR BLOCK MOUNT STAMP SETS!!! Now, before you freak out about how much you *might* hate clear block stamps....Stampin' Up is going to use the SAME rubber!!! I love it. My biggest issue with most "clear" stamps is the plastic, or acrylic, or whatever most other stamp companies call "rubber" does not hold ink like Stampin' Up's rubber. I won't go into more detail (and I can't post pictures...yet)...because you'll get to see the pictures SOON in your Mini Catalog when it arrives in the mail. OOOOOOooooo and SALE-A-BRATION is starting the same time!!! From January 5th through March 31st--with every $50 you spend in Stampin' Up you get to choose a FREE item from the Sale-A-Bration catalog! This year they've included a NEW STREAMLINED PUNCH! There is also a pack of Decorative Paper to choose from. WOW!!! You can also reap the benefits if you HOST a workshop that totals in $300 or more. 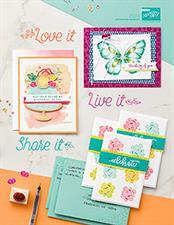 If you decide you'd like to benefit from the discount as a demonstrator and you sign up during Sale-A-Bration you get to choose a new stamp set from the Idea Book & Catalog (the BIG ONE) valued at up to $47.95. FOR FREE!!! The most expensive stamp set we have is $47.95 so you get to choose ANY stamp set from the entire catalog for FREE on top of all the goodies you get in your starter kit at a huge discount! AAAAAMAZING!!! Did you know Stampin' Up has maintained a DORMANT LIST OF STAMP SETS? I forgot they did! BWAHAHAHA! If you decide you gotta have one of those dormant stamp sets, please let me know before January 4th so I can order it for you. I'm pretty much taking December "off" regarding classes. I thought I would try to schedule something before the break but I'm soooo behind on my own Christmas Cards, I really need to get crackin'!! !